You think of everything BB - a special little bath for the little ones. The siskin is lovely and a great close up shot, I think I've seen these on my alder trees. Thanks - he does seem to be saying that Aleyna actually they are quite bold and stay on nyger feeder long after Goldfinches have flown off as you approach. May well be Dawn that black cap is quite distinctive when telling them apart from greenfinches.They are very small as well. Pretty sure they were Siskins and the fact that they were feeding on the alder trees like the gold finches does seem to confirm. Looked at buying nyger seeds the other day, they are expensive like you say but the feeder was £9.99, wow, I didnt get one .... this was at a garden centre. Lovely pic Bonkers. Perhaps you should provide a shower curtain. Think Jacque bought some feeders for around £2.99 Dawn - much better value than ours if you can locate a pet food supplier they often sell nyger seed in bulk much more cheaply. Thats great news Sid charming little birds - do you have cedar trees or larch nearby ? this is where they prefer to nest but very high up which is a shame as their nests are little works of art . I did have an old one Toto but used it under the pond liner to protect it - he could be saying ..well whats the use of that ! Perhaps Dawn could do with one too if she takes regular dips in her pond. Thanks BB, I'll speak to Jacque about the feeder :-) I havent seen my gold crest again :(, I as hoping they would nest in my larch or corsican pines. Ha ha BB, I'll be growing webbed feet, lol, as I'm always getting wet. Then there's the brook of course ... I've lost count of how many times I've fallen in there, lol. Think Spritz has done the same a few times in her stream - never seems to happen on a bright sunny day always when cold and freezing .Perhaps if you bought a bright blue metallic jacket and an orange top - you might tempt your kingfisher back ? Good idea BB, lol. would love to see him back. Glad I'm not the only one that gets wet. We have alot of silt in the bottom of our pond and brook, so its deeper than it looks, I'm always going over the top of my wellies and then of course your wellies get stuck and you keep going, lol. I would love to see a goldcrest's nest - I bet they're tiny and really hard to spot - esp if they're high up. There arn't any pine trees round here....a few conifers and conifer hedges, but no pines I can think of. I think they were feeding on aphids in the apple trees. Lovely shot, BB - reminded me of a canary I used to have! Great thing about a pond they seem to forget that you may be sat there with a camera ! He looks completely stunned that I caught him unawares doesnt he ..they visit throughout the Uk Deida and love the nyger seeds so often seen with goldfinches. Even smaller than a goldfinch so amusing to see them squabble over perches as most things scare goldfinches except siskins so they take the opportunity to scare them ! 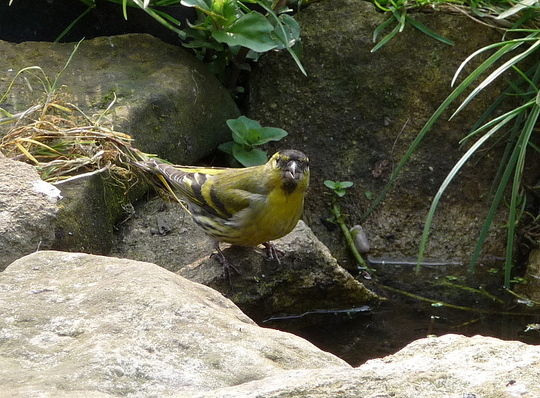 We see more of these than greenfinches .You had a green canary Gee? Not so much green, BB, but a dull yellow with darker patches - we called him Dusty, he had a gammy leg but sang beautifully. Aw sounds like he was happy and had a good home - they dont sing if unhappy do they ? If he sang like Dusty then I could listen to him all day ! That's a beautiful photo..I love photographing the birds as best I can then coming inside to look them up in my bird book if they are unfamiliar to me. Great shot! Very much woodland birds Hollyeves and we see a lot on east coast as over from Scandinavia ..some now stay all year. We are so lucky Skippy as they dont seem phased by us its not that we get close - they come close to us so makes pics so much easier ..
Another great photograph....you must be delighted with these visiting birds, your pond looks so natural I am sure it helps. Oh isn't he beautiful. lovely plumage, but definatly not a norwegian blue. Thanks for your kind comments.Dd...it is a pure joy to watch all the activity round the pond...its like a huge magnet ! Brilliant shot Bb do you feed your birds? If so go have a look at my blog on bird food its a bargain. As not a regular Womans weekly reader Bob thanks for info but find it easier to buy seed locally than get strange looks from my newsagent ..
Perhaps because they come from Scandinavia Sanbaz so we get to see them here on the east coast. Great thinking Bob ..if we start talking recipes and knitting patterns then guess we ve been rumbled . Thanks Janette the pond such a magnet to them even shyest birds seem to forget you re there with a camera ! Thanks Seaburngirl......soon to be off to Scandinavia.........until next year we hope !